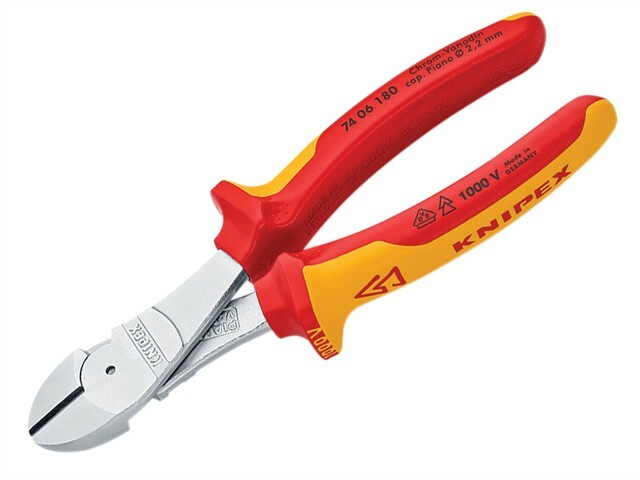 The Knipex 74 06 Series High Leverage Diagonal Cutters are fitted with multi-component grips, VDE tested up to 10,000V and safe for work up to 1,000V. They conform to DIN EN / IEC 60900. With an integrated forged axle for cutting all types of wire including piano wire. Made from forged, vanadium electric steel, multi stage oil-hardened. Chrome plated finish. Precision cutting edges additionally induction-hardened, approx. 64 HRC. High cutting performance with minimum effort due to optimum co-ordination of the cutting edge angle and transmission ratio.